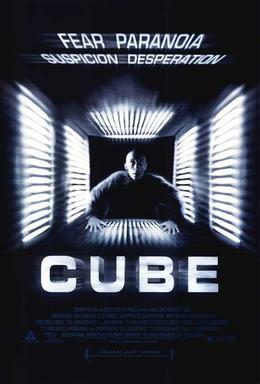 Today I’m going to talk to you about the portrayal of autism in the 1997 Canadian sci-fi horror film ‘Cube‘ (not the fun TV show! 😛 ). I came across this (apparently) cult film last year when I was researching films featuring autism for a college assignment and decided to check it out. 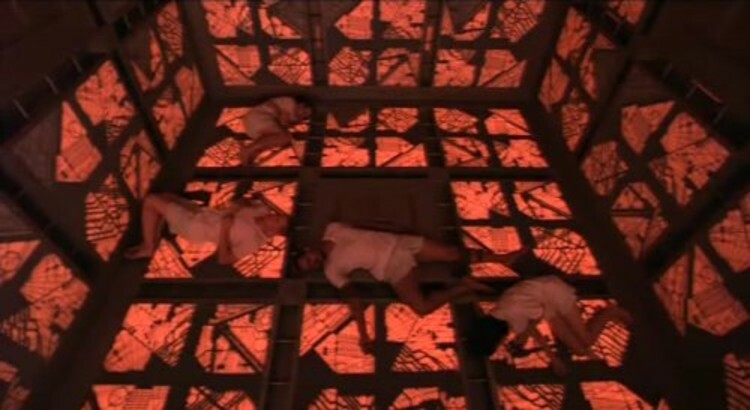 In order to leave, the group must work together to figure out how to escape their deadly prison and crack the puzzle that is the cube. This film was definitely not my cup of tea (if I were a tea drinker! 😛 ), but hey if you’re into the sci-fi horror genre then check out the trailer and see what you think! But what has this film got to do with autism? Well, wouldn’t you know it, the invisible puppeteers who control the cube hand selected their prisoners so that they could combine their skills to navigate the maze, and who did they select? None other than an autistic savant…! This character is key to the prisoners escape as his mathematical skills enable them to calculate how the cube moves so that they can navigate their way to the exit in relative safety…or so they thought! Sooo aside from yet another stereotypical mathematical savant, how is this films portrayal of autism? The actor is actually pretty good showing lack of eye contact, stimming and repetitive movements, colour sensitivity etc. ; however, once again I felt as though I was watching the same stereotypical character I’ve seen in dozens of films before. Autism is a spectrum, each character we see on screen should be unique; but I guess Hollywood has yet to get the memo! Ah the cinema- giant screens, surround sound, confectionery counters, reclining chairs; a perfect treat in many respects (until you need to dash for the loo, or eat too much sugar! 😛 ). But for many people with autism, a trip to the cinema can present a number of sensory challenges- the brightness of the screen and overly loud audio can be quite distracting for example. In recent years, a number of cinemas have begun to host special sensory screenings for children with autism. So what’s different about a sensory screening? So what did I make of the experience? This did however, make it a little bit harder to see any of the night-time scenes which I found a tad distracting. However, I would have a slight critique to make in the choice of sensory films that are shown. Any films that I have seen advertised as sensory friendly here in Ireland fall into the family friendly/childrens category. While it is brilliant that many children with autism are afforded the opportunity to attend these screenings, we often forget that children with autism grow into adults with autism, adults who may want to watch the latest Marvel or James Bond movie, or a racy rom com in sensory comfort. As they say- a lot done, more to do. Today we’re going to have a look at the portrayal of autism in the multi-award winning 1994 classic ‘Forrest Gump‘. So what’s ‘Forrest Gump‘ about? 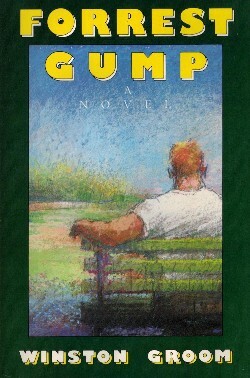 In short, the film details the life and adventures of one Forrest Gump native of Greenbow, Alabama. Slow witted, but kind hearted, Forrest find’s himself in the midst of some of the most pivotal events in modern American history, showing everyone that mental disability does not preclude you from living a most extraordinary life. So how does ‘Forrest Gump‘ fare in it’s portrayal of autism? Whilst ‘Forrest Gump‘ may not intentionally portray autism as in the book, nevertheless Forrest displays many autistic characteristics consistent with a diagnosis of Asperger’s syndrome. He does not always display socially appropriate behavior, as demonstrated by the memorable scene in the White House where he tells JFK that he has to pee! Forrest doesn’t always make eye contact, has some specialist interests (such as Jenny and Ping Pong) and can often ramble on, speaking in monotones as is often associated with AS. Forrest also demonstrates that he is a literal thinker in the film, often leading to some of the more humorous moments. Interestingly, the film depicts Forrest in a more realistic light than in the book. Whilst he is described in both as having a low IQ in the 70’s, Forest is not portrayed as a stereotyped mathematical savant in the film. Although entirely fictional, this film delivers the audience an encouraging message of hope. In spite of his mental limitations, Forrest goes on to lead not just a “normal”, but an extraordinary life. The film follows the turbulent relationship between Donald (Josh Hartnett) and Isabelle (Radha Mitchell)- two adults with Asperger’s syndrome who meet at an autism support group. What makes this film stand out from the crowd is that the film illustrates two very different pictures of AS and two different levels of functionality. Donald, contrary to the OCD stereotype, lives in a hoarders paradise surrounded by birds (and their droppings…), and works as a taxi driver as he is unable to navigate job interviews to make use of his university degree. Isabelle in contrast lives in a highly organized environment, hairdressing by day and painting by night; maintaining a relatively normal social life and appearing to outsiders as merely eccentric. In watching their interactions, a clear difference emerges in their expression of AS. In addition to this, the background support groups also provide us with different pictures of autism with no two characters appearing the same. Autism is unique, and this film remains true to that. Another key element to this film is that of gender and autism. Other films such as ‘Snow Cake‘, have a tendency to portray women using the male experience of the condition, however, in this film we can see that there is a clear difference between autistic men and women. As someone who made great efforts in college to turn qualities that were once perceived as weird into (hopefully) endearing eccentricities, this remark completely resonated with me. However, like many women with autism, Isabelle struggles with issues of mental health and she is seeing a therapist. This film gives us a true insight into the realities faced by many women living with AS. This film has divided some critics as to it’s accuracy in it’s portrayal of autism. On the one hand, it has been praised by many critics as one of the truest cinematic representations of autism, however, others have criticized the film for portraying the leads as having savant skills (Donald is mathematical; Isabelle has artistic and musical savant skills). 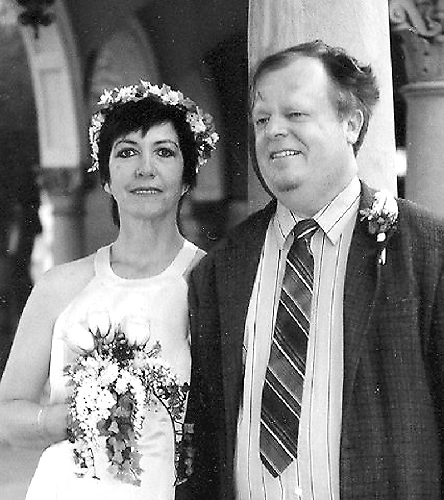 The film is loosely based on the love story of Jerry and Mary Newport, two people with AS who are savants! Fun Fact about the Film: The screenplay for ‘Mozart and the Whale‘ was written by Ron Bass- the same screenwriter for ‘Rain Man‘! This fact is made even more interesting by the fact that ‘Rain Man‘ is often considered inaccurate, while ‘Mozart and the Whale‘ is perceived as the most accurate. In comparing both films, we can really see a clear change in attitudes towards autism in the intervening 17 years. We move from a dramatic and stereotyped vision of autism to a friendlier, more accurate portrayal of the autistic condition. If you want to watch a film about autism, this is the one to see. Earlier this week, popular children’s TV show Sesame Street officially debuted a new puppet with a twist- a puppet with autism! 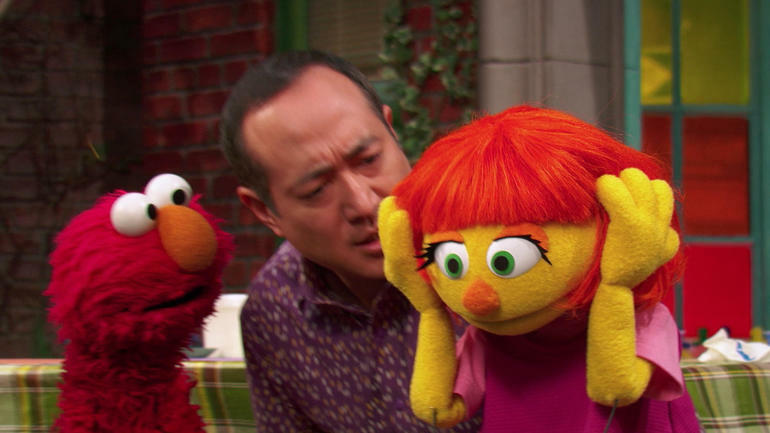 😀 The character of Julia was introduced as part of Sesame Street’s autism initiative, first appearing on Monday to rave reviews from fans, experts and parents everywhere. Whilst only making the news in recent months, Julia has in actual fact been around since 2015, having first appeared in an online storybook about autism as part of ‘Sesame Street’s’ autism initiative- ‘Sesame Street and Autism: See Amazing in All Children’. The creators of Sesame Street established this initiative in 2015 in order to promote better understanding of the condition after a study revealed that children with autism are more than five times more likely to be bullied than their peers!! This initiative was developed in partnership with autism workers, advocates, parents and autists themselves in order to ensure that the topic is handled in the best possible way. So what is Julia actually like? 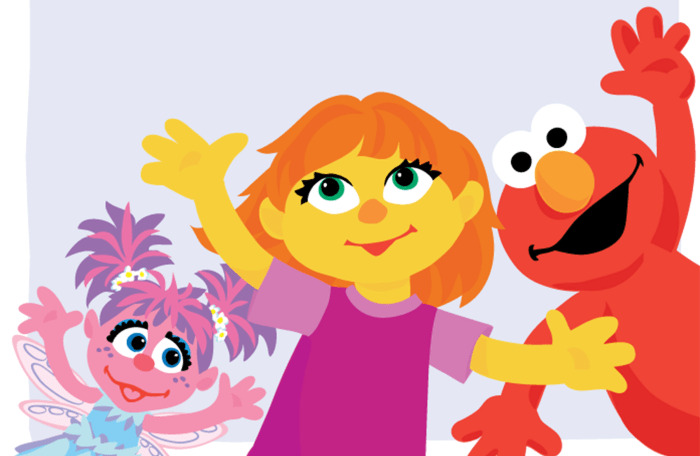 Julia first appears onscreen quietly painting with her friends Elmo, the fairy Abby Cadabby and Alan. When Big Bird comes on the scene, Julia largely ignores him, completely engrossed in her painting. The other puppets are engaging in finger painting, but Julia makes noises of disgust and uses a paintbrush instead, with Abby remarking that Julia hates the feeling of paint on her fingers. Later in the episode, Julia hears nearby sirens and covers her ears in response to the noise, needing to go somewhere quiet for a bit, subtly demonstrating how an autist can struggle with sensory sensitivity. Julia also carries around Fluster, a rabbit toy which she strokes to help her calm down, showing the audience ‘stimming’ in action. Fun Fact: Julia’s puppeteer (who can be seen in this video thumbnail) is a mother to an autistic son in reality! Today we’ll be taking a look at the representation of Asperger’s syndrome in the 2009 (although filmed in 2005) romantic drama film ‘Adam‘ starring Hugh Dancy and Rose Byrne. ‘Adam‘ focuses on the relationship between Adam, a man with AS, and Beth, his neurotypical next door neighbour, as they embark on a romantic relationship. The film charts their relationship from unorthodox origins (Adam unwittingly asks Beth if she is aroused one night when struggling to read her emotions) to (**SPOILER ALERT**) strained ending, as both parties endeavor to better understand the other. So how does ‘Adam‘ rank in it’s depiction of autism? Scientifically speaking, ‘Adam‘ presents the audience with many of the classic characteristics of AS, providing insight into the emotional, sensory and social issues which many of us deal with on a daily basis, such as Adam’s struggles with job interviews. I remember reading ‘The Curious Incident of the Dog in the Night-Time‘ by Mark Haddon as a teenager and identifying with how Christopher does not like his foods to be touching as ‘Adam‘ demonstrates here. In addition to this, there is one slightly insulting moment in the film wherein Adam is not considered “dating material” in Beth’s social circle. Granted, Beth largely ignores the advice of friends and family to pursue a relationship with Adam, buuuut (* *SPOILER ALERT**) ultimately agrees that they are from two different worlds and cannot make the relationship work. Indeed, relationships can be hard for us, but that does not mean that we are incapable of making them work (I know several neurodiverse-neurotypical romantic pairings). One of the biggest problems in the relationship between Adam and Beth is that Adam is unable to tell Beth that he loves her. Believing that Adam sees their relationship practically and not emotionally, Beth makes the decision to break up with him as a result. As previously discussed (Discussion: Love and Romance), saying ‘I love you’ can be quite difficult for an autist, but that does not mean that love isn’t there. I may struggle to say the words to the ones I love, but love them I do. In continuation from the previous post, today I’m going to have a look at a female character with autism in the 2006 indie romantic-comedy drama (that’s a LOT of genres! 😛 ) ‘Snow Cake‘. As discussed in my last post, gender bias is often an issue when it comes to women on the spectrum. Autism is viewed as a predominantly male condition, and as such this is reflected in Hollywood portrayals of autism. We’ve all heard of ‘Rain Man’, but “Rain Woman” is rarely seen. ‘Snow Cake‘ is a really interesting example of this seemingly rare portrayal of autistic women on screen. 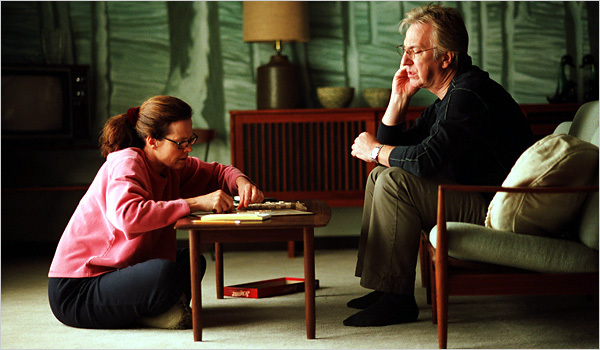 Starring Sigourney Weaver and the late Alan Rickman, ‘Snow Cake‘ explores the unusual relationship between Linda (a woman with high functioning autism) and Alex- a man who comes to visit Linda after her daughter Vivienne is killed in a car accident in which he was involved. Feeling guilty that he survived the accident, Alex set’s out to meet Linda and bring her some gifts that Vivienne had bought prior to her death, finding himself reluctantly drawn into her world. Granted, this line was likely included as a slight from the screenwriter, (a parent to an autistic child), towards public perceptions of autism, buuuutttt it does reinforce the importance of not believing everything Hollywood tells you of autism- something that one need bear in mind as to the portrayal of autistic women in this film in particular. In terms of scientific portrayal of autism, the film gives a fairly accurate depiction of the symptoms. Linda displays mostly male characteristics of autism!! This is a common problem in on screen portrayals of autistic women as much of the information available to actors refers to male experiences of autism. For example, Diane Kruger was advised by a man with autism for her portrayal of Asperger’s syndrome in the series ‘The Bridge‘. When AS was featured in an episode of ‘Grey’s Anatomy‘ many years ago, a behind the scenes featurette revealed that the actress based her performance on a boy she knew with autism! For her role in ‘Snow Cake‘, Sigourney Weaver conducted a lot of research into the role and was actually coached by a woman with autism- Ros Blackburn. Aside from her endearing eccentricities however, the character of Linda does not differ greatly from other films featuring male characters. The problem here may lie in the script for the film, as screenwriter Angela Pell is mother to a boy with autism, and her writing would have been heavily influenced by her experiences. However, the film does provide a good reflection of the reality of autism in that Linda is not a savant or overtly intelligent as is often over-represented. In addition to this, Alan Rickman interestingly chose not to research autism ahead of filming in order to accurately reflect the reactions and frustrations that an outsider would experience in an encounter with an autistic individual, adding a further dimension of realism to the film. All in all, gender issues aside, ‘Snow Cake‘, while not the most riveting of films (wasn’t my cup of tea) does paint quite a realistic picture of life with autism. 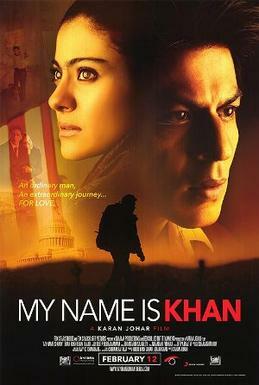 In the next part of my autism on screen series, I’m going to explore the portrayal of autism in the Indian drama film ‘My Name Is Khan‘ (2010). A dual Hindi and English language film, ‘My Name Is Khan‘ follows Rizwan Khan, a Muslim man with Asperger’s syndrome, who set’s out on a journey across America to tell the president that he is not a terrorist following a sectarian attack on his family in the wake of the events of 9/11. So how does this film measure up in it’s portrayal of the realities of AS? The film opens with a disclaimer stating that the film makers have endeavored to depict AS as authentically and sensitively as possible, however, as this is a work of fiction, they acknowledge that certain creative liberties were taken in the portrayal of autism- so as with ‘Rain Man‘, take the film with a grain of salt! That being said, I found this film to be generally quite accurate from a symptomatic perspective. Granted, Khan appears slightly weirder than the average person with AS and many of his symptoms are exaggerated, but overall I felt that this was a solid onscreen portrayal of autism. In particular I felt that this film gave a good representation of repetitive behaviors and sensory sensitivity. Throughout the film, Khan can be seen fiddling with some stones in a repetitive manner. As regards sensory sensitivity, I thought that the film presented more of a normalized and subtle reaction to sensory stimuli than most films featuring autism, particularly in relation to Khan’s sensitivity to the colour yellow (there’s a particularly funny moment where he changes direction on the street to avoid looking at someone wearing a yellow top!). When I first watched this film, I thought that this had to be an exaggeration, but in actual fact, as I mentioned in the last post, boys with autism really struggle to process the colour yellow! Scientists think that this may result from a sensitivity to luminance in autists. Alternatively this may occur as yellow is one of the most heavily sensory loaded colours, as it engages multiple colour detection cells (called cones) in the eye. Comparing this film to ‘Rain Man‘, there is quite a difference in how autism is portrayed. There was a far greater focus on everything that is good about Khan rather than areas of disability in his life, which can often be exploited in film for dramatic effect. Unlike ‘Rain Man‘, modern films about autism, such as this, have the added benefit of over twenty years of research and observation of the autistic condition, leading to more accurate depictions/attitudes to difference on screen. Unfortunately however, Khan is depicted as quite intelligent (even called a genius), with superb memory and a savant-like ability to fix any mechanical item known to man, further promoting the stereotype of the autistic savant. These traits however, are somewhat muted in comparison to ‘Rain Man‘, giving a slightly more realistic portrayal of autism. I’m going to change things up a little today with a new series examining the portrayal of autism on screen. So let’s start at the very beginning with perhaps the most famous portrayal of autism in cinema- 1988’s ‘Rain Man‘. For those of you who have not seen the film, ‘Rain Man’ focuses on the relationship between brothers Charlie and Raymond ‘Rain Man‘ Babbitt as they embark on a cross country road trip to Los Angeles (Raymond refuses to fly unless it’s with Qantas- the safest airline in the world!). Charlie grew up without any knowledge of Raymond, only discovering his existence upon learning that his father’s multi-million dollar fortune had been bequeathed to the mental institution in which he resides. And so Charlie sets out to be Raymond’s carer in order to access the fortune, but *SPOILER ALERT*- ultimately has a change of heart. Classic Hollywood ending. Winner of 4 Oscar’s, ‘Rain Man’ has been highly critically acclaimed- but does the film match up to the reality? ‘Rain Man‘ is generally thought to be an accurate portrayal of the autistic condition in scholarly papers. Indeed, there are many areas in the film in which Raymond perfectly demonstrates some of the classical signs of autism- sensitivity to touch, restrictive and repetitive behaviors, specialist interests, coordination issues, deficits in social communication, autistic meltdowns etc. The story where Raymond inadvertently burned Charlie in the bathtub as a child (which led him to be institutionalized), also brings back many memories from my childhood. There have been many cases where I have inadvertently harmed my siblings- why just yesterday I threw a foam roller at my sister in an attempt to help her stretch out her legs, only for it to whack her in the throat…oops! But my intentions were good!! Acting without thinking is something that I tend to do an awful lot of (probably why I overthink and don’t act when it comes to love 😛 ). My mother had to keep a really close eye on me growing up after she found me attempting to push hair-clips down my sisters throat…I have no real answer for why I did that, but based on similar experiences, I’d say scientific curiosity probably had a role to play! 😛 😉 We’ll explore curiosity and impulsivity a little bit more in the coming weeks. Here’s a fun article I found about a man who lost $17,000 after trying to use his autistic friend to count cards! In addition to this, Raymond is also described as ‘high functioning’ in the film, BUT Raymond is incapable of living independently. Whilst the definition of what constitutes high functioning autism varies, for many, Raymond does not fit the high functioning category and therefore does not come across as a true reflection of autism. One of the biggest issues here I believe, is the fact that the character of Raymond is based on Kim Peek- a “megasavant” who did not in fact have autism, but FG syndrome (a rare genetic syndrome characterized by intellectual disabilities, low muscle tone and an abnormally large head). On top of this, Dustin Hoffman famously prepared for the role by observing autistic adults for months in psychiatric institutions. However, Hoffman by his own admission describes Raymond’s character as an unrealistic grouped composite of high functioning autists he encountered during his research. When I first got my diagnosis, this film naturally came to mind, however, I really struggled to relate what was presented on screen to my reality. Indeed, ‘Rain Man‘ reflects some of the realities of autism, but not all. ‘Rain Man‘ is an excellent film with superb acting from Dustin Hoffman, but it comes from a time before the ‘spectrum‘ when knowledge of autism was limited.